Here we are, Consumers, approaching the winter holiday of gift giving.. errr.. of Christmas. Of course, don’t forget about Hannukah and Kwanza. This is the month of celebrating and gift giving. So, what better way to kick off December but with a 12 days round-up of the best gadgets, tech, accessories, and luxury products! 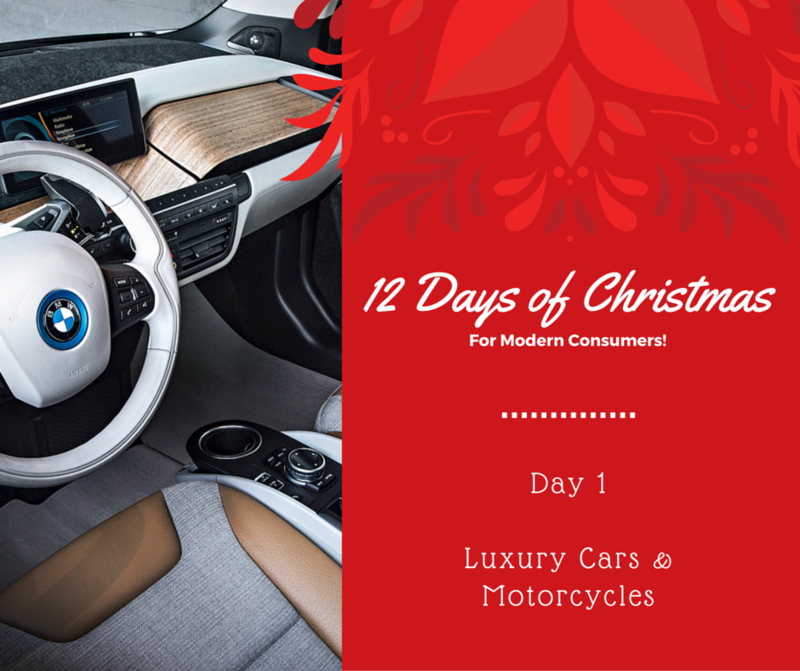 Kicking off the 12 Days of Gifts for Modern Consumers is our list of luxury vehicles! Maybe you really want to treat that special someone (or yourself) this month! It doesn’t get much more American than the new 2016 Lincoln Navigator L. Like its Ford Expedition cousin, this is a big and brash full sized SUV with an extended wheelbase, which gives it the L designation. The engine is no slouch, powered by a 5.4 L V8 that puts out 310 horsepower and 365 lbs of torque, but when the thing-you-are-trying-to-move weighs a massive 6,000 pounds, it affects performance just a tad. The all new Cayman GT4 has been awaited with baited breath for a long time, and boy was it worth it. Rave reviews, from almost all major authorities in the automotive world, mean that Porsche have a hit a big home run with the Cayman GT4. It is powered by a 400-hp 3.8L version of the signature Porsche flat six, and comes in at a price point that is under the 911. Lexus pulled out the stops with its new RC, taking it to the famed Fuji International Speedway to hone in its performance. It continues the aggressive “love it or hate it” styling that Lexus has adopted lately. The top of the line RC-F is powered by a 5.0L V8 producing 467hp and comes in at a cozy $63,000. The Ferrari 488 was rightfully called one of the prettiest cars to come out of Maranello in a long time. With the Spider, it gets even better – now offering a retractable hardtop so that you can really hear the beautiful note of the Italian V8 under the hood. The 488 Spider tops out at 203mph, produces 661 bhp, and does 0-62mph in 3 seconds flat – what more do you want? Billed as the “Megacity” electric vehicle, the BMW i3 was a much anticipated car. It comes as both a range extended version (with a 2 cylinder engine along with the electric motor) or a full electric version. The motor is rated at 170 bhp with an EPA rated range of 81 miles for the fully electric version. Early adoption is not cheap though, coming in at about $44,000 before incentives kick in. The new Indian Scout Sixty physically looks pretty much identical to the current Scout. But it’s under the hood (or more like under the seat?) that the change really takes shape. The new Scout Sixty is powered by a 999cc (60-cubic-inch) V twin motor, rather than the 69-cubic-inch engine from the current Scout. It also produces slightly less power at 78 bhp, vs 100 bhp for the current Scout. The Scout Sixty also comes in at $2,000 less than the $10,999 Scout. Loud, flashy and fast. Those words describe the new Victory Magnum X-1 pretty well. Do you need a 200W, 10-speaker surround sound system on your motorcycle? The Magnum X-1 is for you. Do you need a glossy black motorcycle with bright red stripes? The Magnum X-1 is for you. Do you need a motorcycle that announces your arrival with loudness and smoke? The Magnum X-1 is for you. Stay tuned over the next 12 days to get some great gift ideas for the home, travelling, kids, pets, women, men, and more!